Golden Sheen sapphire is most similar to black star sapphire, star sapphire and star ruby. Black star sapphire sells at wholesale between $50-$100 per carat, while star sapphire and ruby can be anywhere from $100 to $1,000 per carat. Golden sheen sapphire is still relatively unknown in the retail market, but is becoming increasingly famous with jewelry designers and collectors. The price has risen from $5 per carat to $15, $25 and now $40 per carat, with some pieces fetching as much as $100 per carat. As it becomes increasingly widely known, the carat price will continue to increase. Golden Sheen Sapphire comes from only once known source in the world. That mine is now depleted. While other types of gemstones are still being mined in quantity, Golden Sheen Sapphire will become increasingly rare over time. 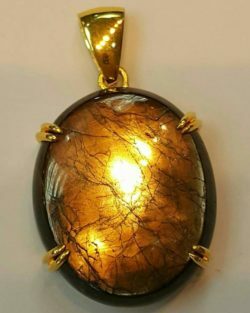 Further, the nature of the hematite and ilmenite inclusions make each stone individually unique, like a fingerprint, each stone has its own individual character and beauty. Perhaps the greatest value of all. Each stone is uniquely beautiful. Golden Sheen Sapphire has no heat or other treatments at all. It is completely natural, created over many millions of years of geological formation. Being sapphire, one of the hardest materials on earth, the natural beauty will never diminish.